Mining activities at the Ntunga site (file photo). Dodoma — Small scale miners, spirits producers and property owners will have a reason to smile after the government cut taxes they pay in amendments to various tax laws made by Parliament yesterday. In the rare mid-year amendments, passed by Parliament yesterday after a brief debate by legislators, the government amended the Excise Management and Tariff Act so as to reduce the excise duty for spirits made of locally produced grapes from Sh3,315 to Sh450 per litre "to encourage manufacturers to use locally produced grapes to promote grape farming." "Clearly, the amendments, specifically those to the Mining Act, are an implementation of resolutions of the stakeholders' conference chaired by President John Magufuli last month. I'm aware a reduction in the Excise Duty for spirits is meant to make locally made spirits competitive," the expert who spoke on condition of anonymity noted. 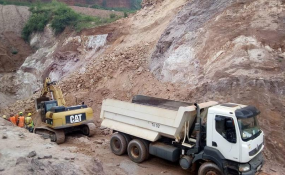 "Furthermore, the amendments aim at regulating and controlling trading in minerals with a view to ensuring that revenue relating to trading in minerals are efficiently collected," said Prof Kilangi. Nzega lawmaker Hussein Bashe (CCM) commended the government's initiatives, but challenged that more should be done to help grape producers. "Reduction in excise duty on spirits it just addresses by 40 per cent the challenges that grape stakeholders are grappling with," he noted. Ndanda lawmaker Cecil Mwambe (Chadema) talked about preparation of regulations for the enforcement of the amendments. "There should be enough consultations to stakeholders during preparations of the regulations, to pave the way for win-win situation," Mr Mwambe said. Kawe legislator Halima Mdee (Chadema) also said; "We need to be consistent during preparations of our laws, to avoid frequent amendments." Finance and Planning minister Philip Mpango said tax exemption on machines used in processing of minerals would be considered in next budget (2019/20). Reacting to the amendments, Speaker Job Ndugai said: "Sometimes it is better to set lower rates in order to make sure that many people pay taxes than to set high rates, which will see only few people pay taxes."